I love shopping at TJMaxx for kitchen items. Its like shopping at an upscale yard sale. I never know what I'll find. This time, I found this bacon press for $3. It is made from cast iron, has ridges and a wooden handle. Lets see how this works for bacon! Bacon is something that we don't eat every day. Not even once a month. We probably have it 4-5 times per year. I've tried microwaving bacon and end up using a half roll of paper towels and leaving my microwave smelling like bacon for several days. 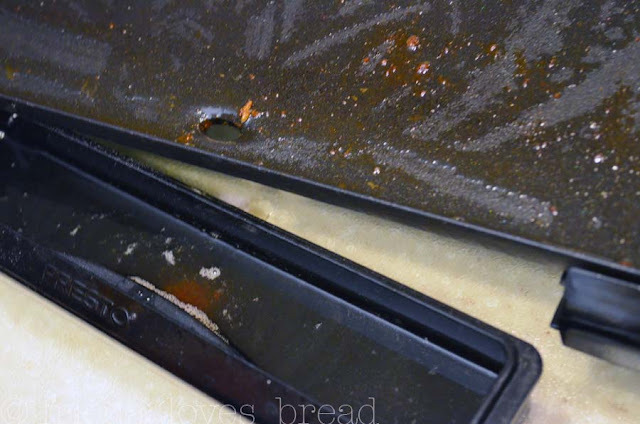 I've thought about baking it in the oven, but the thought of spatters and clean up is more than I can handle. I enjoy using my Presto Cool Touch griddle. I got it at Kohl's on sale and with a cool 30% coupon, it was a steal at $10. 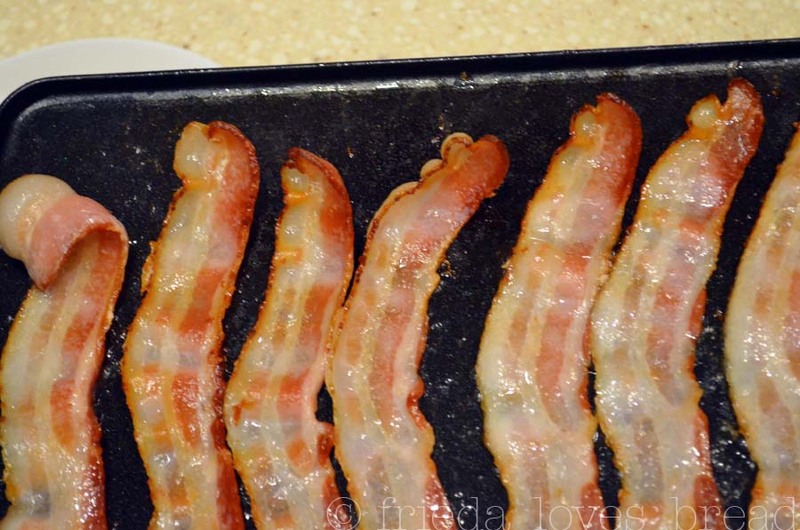 My favorite style of bacon is the thick Hickory Smoked Maple bacon from Sam's Club. I am a sweet~salty combo gal and this bacon is no exception. When you have a thick style bacon, it is important to cook it low and slow to render as much fat as you can. I set the griddle's back legs on small, inverted plates to raise it, helping the grease to drain into the slide out drip tray. As I see the bacon begin to curl, I move the press over to flatten it. I believe that flattening the bacon ensures more even, thorough cooking. I turn the bacon often, moving the press around the grill. I like my bacon brown, but not super crisp. 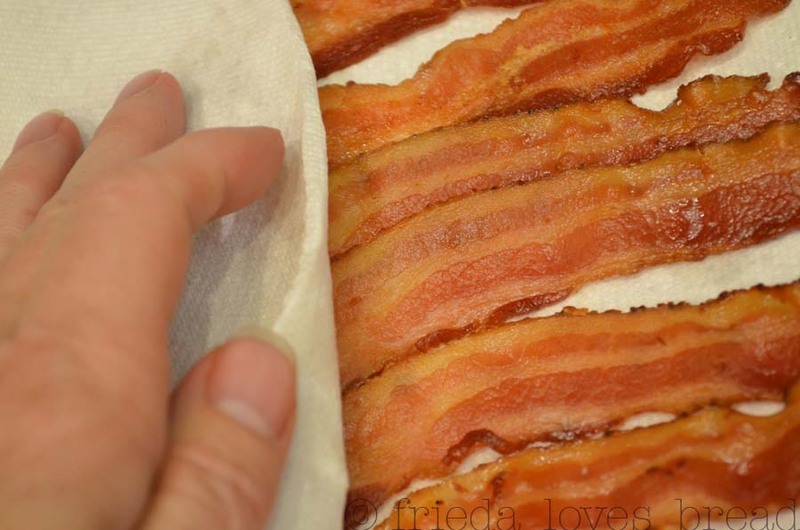 The bacon is put onto a couple layers of paper towels and dabbed to pick up extra grease. 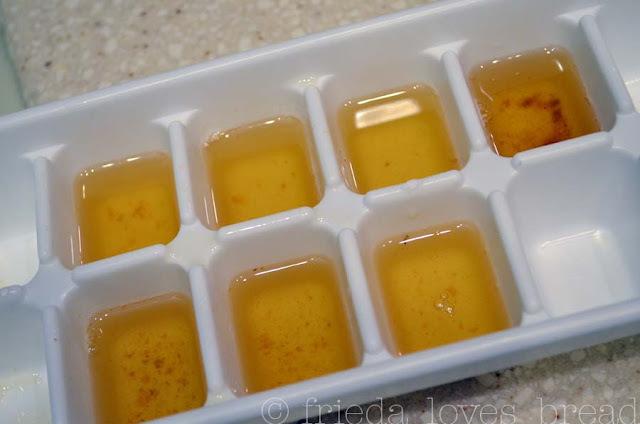 Here's the handy dandy slide out drip tray. But wait ... don't throw it away! Put 1 Tablespoon each into ice cube trays. Freeze, then put into a freezer safe baggie. Perfect for when you need just a little bit of flavor for frying eggs, potatoes, hashbrowns, or even in refried beans. You can find a similar press on Amazon. In order for a gadget to fit my Cool Kitchen Tool collection, it needs to serve more than one purpose. 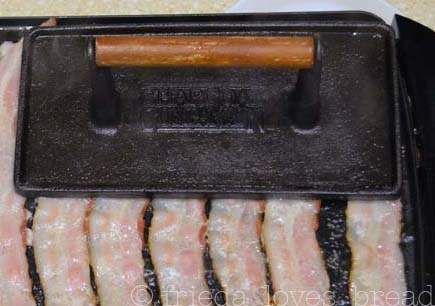 This press works well for bacon ~ I think it could serve as a weight for panini sandwiches, pounding chicken, or heated on an outdoor grill and putting it on top of meats for even cooking. Raising the grill on one side so the grease drains better is genius! Thanks for the tip! OH MY GOSH!! Now I seriously need one of those! :) How perfect. We eat bacon a lot at our house, if we have it fresh after we get our pork from the butcher. After its gone, maybe we don't eat is so much.